RTH (Rettungstransporthubschrauber) Eurocopter EC135 P2 D-HDEC "Christoph 31" of ADAC-Luftrettung GmbH was photographed at the helipad of the ADAC-Luftrettungszentrum Berlin in Germany. The call sign "Christoph" is used for the German lifeliner helicopters since 1970 and is derived of Saint Christophorus, the Patron Saint for all travellers. The RTH facilities at the Universitätsklinikum Benjamin Franklin, Berlin, were opened on 1 September 1987. Today this location, located in Steglitz, is known as Charité Berlin - Campus Benjamin Franklin. 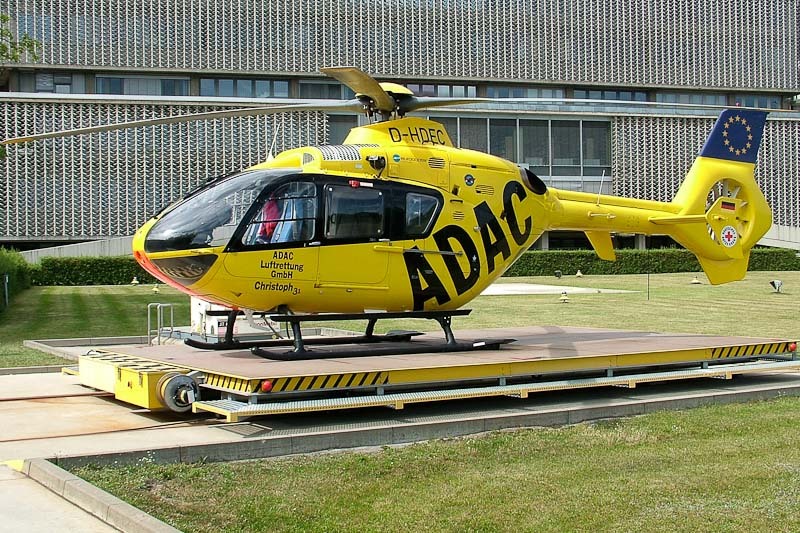 The ADAC-Luftrettung helicopter in service as "Christoph 31" was the MBB BO.105 until the type was replaced by the EC135 on 14 November 2001. The 2004-built Eurocopter EC135 P2 c/n 0321 was registered D-HDEC on 1 March 2004. On 3 January 2011, shortly after landing on the scene of an accident at Berlin City the D-HDEC "Christoph 31" suffered substantial damage to its main rotorblades when the blades were hit by an automatic barrier that suddenly opened. After repair the helicopter returned the same month in service as "Christoph 31".